Lanzarote, a member of the Canary Islands, is a heaven for the holidaymakers with a variety of beaches, volcanic landscape and attractions. The island is located in the Atlantic Ocean. Lanzarote is the most easterly of the Canary Islands and lies about 150 km. (70 miles) off the coast of Saharan Africa. The sub-aquatic and moon-like scenery, crystal-clear waters, nature, thirsty soil and the oasis of palm trees make Lanzarote one of the most popular holiday resorts in Spain and the Canary Islands. Lanzarote, which means “the red group of mountains” is an intriguing island full of surprises for holidaymakers. The sun-bathed landscape of the island of Lanzarote, with its delightful, exotic beaches and wonderful volcanic valleys can be enjoyed all year round by the holidaymakers. About three hundred volcanoes form the ash and create a moonscape that covers much of the island of Lanzarote. The island is also announced as Biosphere Reserve by UNESCO. Over three-quarters of the surface area of the island is speckled with volcanoes. Arrecife is the capital city and the commercial and administrative town of the island of Lanzarote. 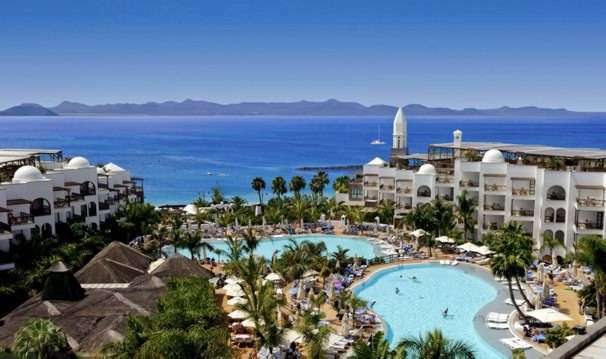 Puerto del Carmen is one of the most popular holiday resorts in Lanzarote. There are lots of places to visit and see in Lanzarote. The volcanic landscape is excellent and the places including Timanfaya National Park, El Golfo, and Los Verdes caves is worth a visit and see in Lanzarote together with superb, golden sandy beaches. A visit to the Timanfaya National Parkis one of the best things to do and see in Lanzarote. In addition to the attractions of Timanfaya National Park; the surroundings of the Timanfaya National Park also offer many other points of interest that include; a ride around the volcanos on a camel, the unique crops at La Geria, the coastal area of Los Hervideros where lava and the Atlantic have converged to create a tormented rockscape and finally the spectacular emerald green crater of El Golfo. In addition; the beaches of Papagayo on the south, the cliffs and beach of Famara to the west, the Cactus Garden, the Malpais de la Corona with the mysterious volcanic tubes of the Jameos del Agua and Los Verdes Cave and the splendid lookout of Mirador del Rio in the northern part of Lanzarote are other popular sights to visit and see in Lanzarote. As for getting to and around Lanzarote; the island may be reached by sea and by air and it is one of the best communicated in the Canary Islands. The two main ports cover regular and inter-island traffic routes that include; Playa Blanca to Fuerteventura and Arrecife to the peninsula and Gran Canaria and Tenerife. At the Lanzarote airport, there are many daily flights from all major European cities. In addition, there are also daily flights to the capitals of the Canary Islands and the peninsula, mostly to Madrid and Barcelona. For exploring the island’s interior, rent a car or book a seat on an organized trip at any travel agency or hotel is recommended. It is impossible to speak of traditional architecture in Lanzarote without mentioning the name of Cesar Manrique. He is a 20th-century artist, designer, sculptor, and architect devoted his life to the island of Lanzarote where he was born. The island’s architecture of white walls, green windows, and unique chimneys all belonged to him. Cesar Manrique designed many of the structures which are now examples of the harmony that can exist between architecture and nature that include; the Monumento al Campesino (Monument to the Peasant), Jameos del Agua, Mirador del Rio (lookout), and the Cactus Garden.